SEO is an acronym for Search Engine Optimization or Search Engine Optimizer. 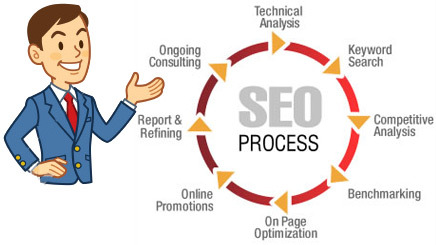 SEO is an acronym for Search Engine Optimization or Search Engine Optimizer. SEO is the process of improving the visibility of a web site or a web page in search engines via the "natural" or un-paid ("organic" or "algorithmic") search results. Other forms of SEM (Search Engine Marketing) target paid listings. In general, the earlier (or higher on the page), and more frequently a site appears in the search results list, the more visitors it will receive from the search engine. SEO may target different kinds of search, including image search, local search, video search and industry-specific vertical search engines. This gives a web site web presence. However, it is important to remember that in order to bookmark a site, your visitor has to know about it, and the first time they find it is very often through a search engine. (SEM) Search Engine Marketing must therefore be an essential part of your PR strategy. “SEM (Search Engine Marketing) is an art of using search engines as a channel for increasing number of visitors to your website.” If you get higher rankings in search results, more searchers are likely to click on your listing, leading to a steady stream of interested readers or -- hopefully -- happy customers. It is observed that normal tendency of a web surfer who uses search engines to get solutions to their needs and answers online does not go beyond 3-4 pages of search results that account for around top 40 results. Thus, only top ranked websites gets hits and others miss their opportunity. Search Engine Optimization (SEO) is basically aimed at giving your website higher listing and rankings in search results so that maximum number of users is likely to visit your website and that in turn generates more business enquiries. For past 12 years, we at RAM COM .Solutions speak the language of successful search engine optimization (SEO) and established ourselves as leaders in search engine optimization in Hyderabad. Our Search Engine Optimization (SEO) team has continuously upgraded themselves with various tools and techniques that can be used for promoting our client's web site and helped us establish as one of the Internet's leader in search engine optimization (SEO) business. At RCS, our aim is to give your website a good position in popular search engine results lists. Our proven expertise in Web Analysis, Content Analysis and Keywords Analysis ensured best search engine rankings to our clients. By a good position we mean top listings in search engines. We leverage our understanding of search engine algorithms and combine this with a lot of regular hard work to optimize your pages. We follow a systematic methodology for promoting a web site on search engines like Google, Yahoo, Rediff, MSN, Alta Vista, Hotbot, etc.